I’m writing this morning from the President’s Club Lounge in Terminal C at Newark Airport. I first tried to get to Newark on Sunday night, gave up, and returned last night (Thursday), only to encounter more delays. My 10:40 arrival quickly became 12:10am over the course of the day. Thank goodness, however, that I left St. Louis last night, because the flight in from St. Louis this morning is also delayed, and I almost certainly would have missed my flight to Shanghai. All of this occurred after my adventures on Sunday, when I tried to leave St. Louis for Singapore, connecting through Newark. In the end, I gave up trying to get to Newark. Flights were delayed beyond my connection and, since I didn’t want to fly to Newark late on Sunday and wait for an 11pm departure Monday night, I went back home and reconfigured my trip to go directly to Shanghai today. As I talked to colleagues, I heard things like “Newark is always a mess. I never fly through there.” This was followed by similar sentiments regarding Chicago and Dallas, Atlanta and Houston. Is there really a place where you don’t encounter delays from time to time? Snow in Chicago – wind in Dallas — rain in Newark. Pick your poison and relax. Nothing you can do. So I started thinking, given my fascination (obsession?) with Spider Man, whether having Spidey’s superpowers would have made a difference this past week. I thought for a while and couldn’t come up with a single one of Spiderman’s powers that would have helped. Spidey doesn’t fly. He can stick to an airplane as it flies, but he primarily moves by swinging on his web down the Manhattan streets. I thought about all the comic books I’ve read and I have only some fleeting memories of Spidey outside the U.S.A. (not including space, of course). To test this, I Googled “Spider Man Airplane” and “Spider Man Travel” and a few others. I got nothing. I’ve decided that, despite all his powers, Spider Man would have been delayed along side the rest of us getting to Newark. However, he probably would have called Iron Man or the Fantastic Four to give him a lift. Maybe Silver Surfer or Human Torch could have moved the storm fronts or pushed the airplanes a little faster to make up for those delays. Great to have friends like that. 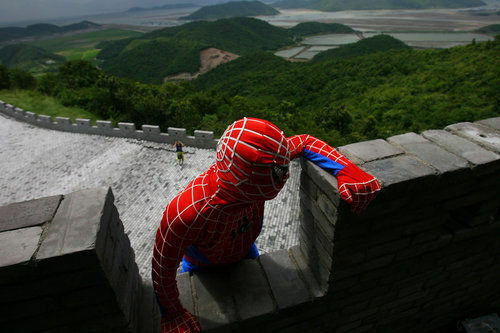 I did find the picture here of Spider Man climbing the Great Wall of China. I wonder how he got there?